Small volumes of APOC4 recombinant protein vial(s) may occasionally become entrapped in the seal of the product vial during shipment and storage. If necessary, briefly centrifuge the vial on a tabletop centrifuge to dislodge any liquid in the container`s cap. Certain products may require to ship with dry ice and additional dry ice fee may apply. Apolipoprotein (apo)C4 gene is a member of the apolipoprotein gene family. 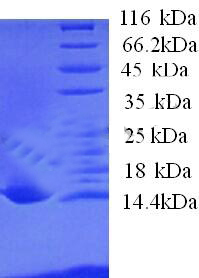 It is expressed in the liver and has a predicted protein structure characteristic of the other genes in this family. Apo C4 is a 3.3-kb gene consisting of 3 exons and 2 introns; it is located 0.5 kb 5 to the APOC2 gene. NCBI/Uniprot data below describe general gene information for APOC4. It may not necessarily be applicable to this product. 1. APOC4 rs1132899 polymorphism was associated with an increased risk of premature coronary artery disease in Chinese subjects.